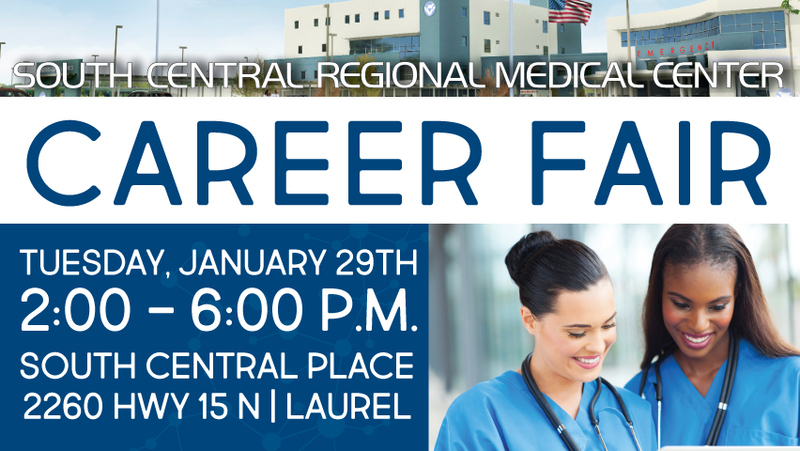 Tuesday, January 29th, 2 p.m. – 6 p.m.
South Central Regional Medical Center will host a career fair from 2 p.m. to 6 p.m. on Tuesday, January 29th, at South Central Place in Laurel. Representatives from South Central Human Resources will be onsite for interviews and to answer applicant questions. The career fair will be held at South Central Place, 2260 HWY 15 North in Laurel. South Central Regional Medical Center offers a comprehensive benefit package, including: tuition reimbursement for full time employees, scholarship opportunities for nursing, medical/dental insurance, long term disability, cancer plan, wellness/fitness center, daycare center, earned time off/sick time, competitive wages and an excellent work environment. Facilities within SCRMC include: medical center, long-term care centers, medical clinics, cancer center, wellness and rehabilitation center, ambulance service, billing offices and more. For more information, call 601-399-0517. To apply online or for a complete list of open positions, visit scrmc.com/careers. South Central Regional Medical Center is an equal opportunity employer.